By paying close attention to laser optics, gas flow, cooler performance, and machine cleanliness, metal processors can ensure that the laser die cutter works properly and may extend the laser die cutting machine's operating life. 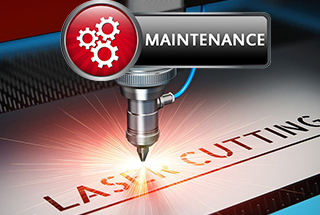 After any type of maintenance of the laser die cutter's optics, it is important to return it to the OEM specifications. Otherwise, out of specification optical components can affect the quality of the pattern, beam quality, cutting performance and optical element life. Most laser die cutting machine uses assist gas for cutting. The assist gas flows through the laser head and out through the laser beam from the cutting nozzle to achieve a cleaner cut. Oxygen, nitrogen are the most common auxiliary gases for laser die cutter. If the laser die cutting machine manufacturer's auxiliary gas is workshop air, the compressed air needs to be free from pollution and moisture. Therefore, the lines are always kept clean and the system maintains proper air pressure and air filtration is critical. Pollution from air sources can affect cutting performance, machine life and productivity of laser die cutter. One of the most obvious but neglected areas in laser die cutter’s maintenance is keeping equipment clean. Processing areas, support slats, waste drawers, slu, and trays are the first to suffer from negligence maintenance. If these areas are not properly maintained, it does not require fancy tools or gauges to tell the manufacturer. The accumulation of debris, dust, grease, and dirt on these surfaces will not only make the device appear unimportant, but will also affect the performance of the laser die cutting machine. The delivery of gas to the resonator essentially requires no maintenance unless the hose is ejected or leaked. Sometimes leaks may be overlooked, but laser die cutting machine operators will find differences in the output power or gas usage of the machine. This is a good guideline for manufacturers to follow: Each time the resonator cylinders are changed, they must be soaped. If there is a leak, this immediately tells the manufacturer and prevents significant loss of productivity. Yisong die board sawing machine, only consists of sawing table & air compressor, saw blade is the only consumables, easy for machine maintenance & repair. < Part 1: How much does it cost to run a laser die board cutting machine?